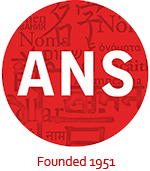 The American Name Society was founded in 1951 by a group of scholars interested in furthering research in onomastic studies. At that time, much of the research being done on onomastics was conducted by scholars associated with the American Dialect Society (ADS) and focused on placename research. However, by the early 1950s, names scholars felt that the time had come to create a separate organization devoted specifically to onomastic inquiry. Most of the early members were scholars in literature and languages, although a few of the founding members came from other disciplines, including geography and law. The use of the term “American” in the Society’s name was chosen to indicate that the Society was founded in the United States of America, as opposed to limiting the scope of its members or the scope of its research. In fact, the organization has always been internationally inclusive, as evidenced by the diversity of its members, conference presenters, and journal publications. One of the primary goals of the ANS is to offer scholars the opportunity to provide a scientific platform for sharing the results of their research on names and naming practices from around the world. Towards that end, since 1953, the ANS has published a scholarly journal entitled Names: A Journal of Onomastics. Published quarterly by Taylor & Francis, Names is internationally recognized as one of the world’s premier journals in the study of onomastics. In addition to a broad diversity of scholarly articles, the journal also features critical reviews on the latest publications in onomastic research. View the complete list of ANS Presidents here.